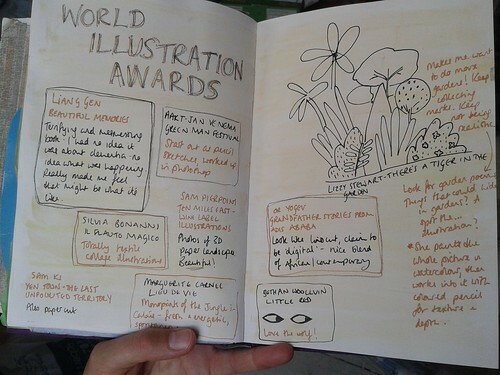 I made it to the World Illustration Awards exhibition at Somerset House - and I'm so pleased to have done so! Sometimes I feel I spend too much time inspiring myself with illustration exhibitions when I drown myself in children's books at home every day, but this one - well, this exhibition was great. Not just final images, but sketches in progress, a range of media, and interviews with artists. And I was reminded of the wonder of illustration across the genre - that I am inspired by it every day in advertising, theatre, magazines ... Sometimes I feel embarrassed to be taking photos of billboards on tube journeys and collecting flyers simply because they're beautiful - this exhibition reminded me that this is exactly why I do that. Above illustration, Ten Miles East wine label by Sam Pierpoint. It's too tempting to share everything, so here instead are the notes from my sketchbook!